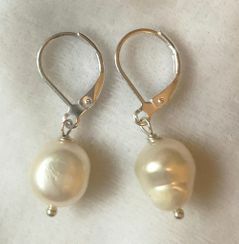 Satori Rue has married the classic pearl, with the natural freshwater shape, and the simple drop earring. The shape is a little irregular, and the natural texture and shape gives it interest and dimension. A wonderful simple design.